Make this "bucket list" experience the best it can be! Over one million people celebrate New Year's Eve in Times Square. Getting a good view of the ball drop and staying comfortable during the long wait for midnight's arrival will be easier with these helpful tips. Folks begin arriving in the early afternoon on December 31. Some of the prime viewing spots will be filled by mid-afternoon. Be aware that you won't be able to return to "your spot" if you need to leave to eat, use a bathroom, or move for any other reason. They even start to block off whole streets for access to the heart of Times Square once the crowd begins to build. Port Authority bus terminal, while crowded, is a good place to stop before you begin your wait in Times Square. There are public bathrooms inside of the Port Authority, as well as places to buy food and drinks. Once you've staked out your spot in Times Square, be prepared to stick it out until midnight. It's a good idea to have a nice big lunch before settling in. Unless you want to lose your spot, this means being dressed for the weather, with extra layers to add as it gets later and colder. You should also be prepared with snacks, drinks (no alcoholic beverages are permitted), and diversions. If you arrive in Times Square at 4 p.m., there are still 8 long hours until the ball drops at midnight. Bags/backpacks are not allowed, so wearing a coat with plenty of pockets is a good idea. 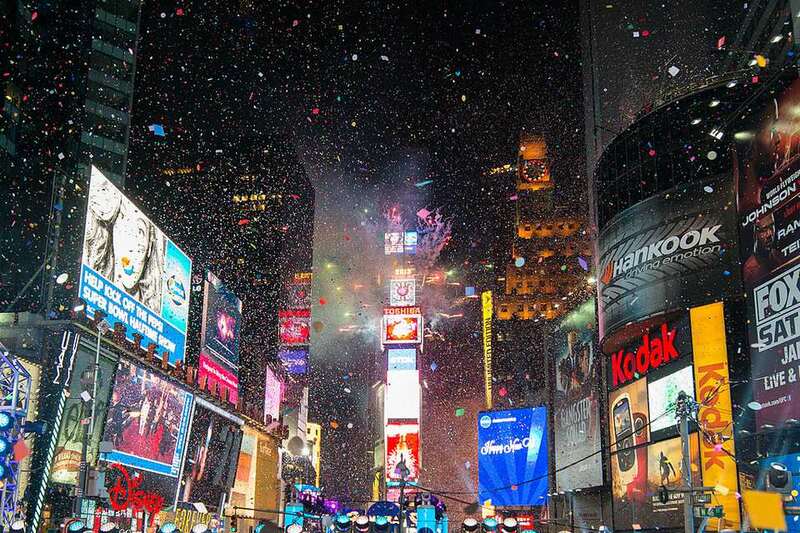 Approximately one million people spend New Year's Eve in Times Square. This means that if you are within view of the ball, you will frequently be tightly packed in, quite possibly for hours before the actual ball drops. The police will periodically "force" different areas to crowd in, but the crowding will typically lessen (a bit) shortly after. This is definitely not a good activity for people who get anxious in large crowds or claustrophobic. Your feet will get stomped on. People will block your view. Someone is bound to bump into you. Keep your cool and you (& those around you) will enjoy the New Year's Eve ball drop. Remember everyone is there to have a good time and it's likely a bucket-list item for them too, so be kind and friendly. There is a mini-celebration every hour in Times Square, as different countries ring in the New Year around the world. This is a fun diversion that definitely helps the time pass more quickly and builds the excitement for the real New Year's Eve countdown. The weather in New York City on New Year's Eve can vary widely. If it's going to rain or be bitterly cold, you might want to consider alternate plans for New Year's Eve in New York City. You might get lucky and have an unseasonably warm day, which will make the wait outside much easier. Reservations are essential, and most restaurants, bars, and clubs have steep entry fees/cover charges, but if you're at a restaurant, bar or hotel in Times Square there's a good chance you'll be able to step outside and watch the ball drop at midnight.